Explanation: Captured last week after sunset on a Chilean autumn night, an exceptional airglow floods this allsky view from Las Campanas Observatory. 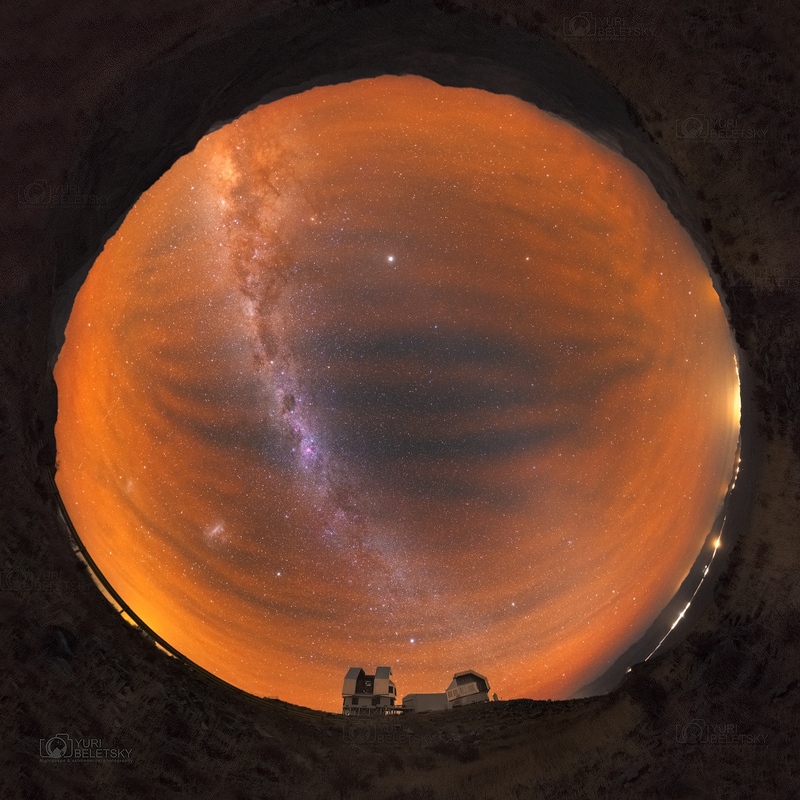 The airglow was so intense it diminished parts of the Milky Way as it arced horizon to horizon above the high Atacama desert. Originating at an altitude similar to aurorae, the luminous airglow is due to chemiluminescence, the production of light through chemical excitation. Commonly recorded in colour by sensitive digital cameras, the airglow emission here is fiery in appearance. It is predominately from atmospheric oxygen atoms at extremely low densities and has often been present during southern hemisphere nights over the last few years. Like the Milky Way, on that dark night the strong airglow was very visible to the eye, but seen without colour. Jupiter is the brightest celestial beacon though, standing opposite the Sun and near the central bulge of the Milky Way rising above the eastern (top) horizon. The Large and Small Magellanic clouds both shine through the airglow to the lower left of the galactic plane, toward the southern horizon.